Koda is Georgia SPCA's 2-year old Belgian Mallignois. 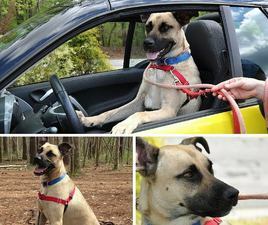 He has learned lots of tricks in the past 3 months that he has been with them, and now he is working on how to drive a car! This handsome boy is very smart and would be the perfect companion for a runner or hiker. Koda is waiting at the shelter for the family that can provide lots of exercise and activity. Why not go and meet him today? If you are interested in adopting Koda, or even just want to stop by to stay hi, you can visit their website, or head to the sheleter! Are you looking to adopt a pet? Do you know of an animal that should be our Pet of the Month? Feel free to tell us about it by contacting us.